Fernando Gaviria delivered the second-ever leader's jersey to Colombia with a sprint win on day one of the 2018 Tour. FONTENAY-LE-COMTE, France (VN) — It was a historic, if not expected, day that saw the second-ever Colombian claim the Tour de France’s yellow jersey. Fernando Gaviria (Quick-Step Floors) delivered the leader’s jersey to Colombia with a sprint win on day one of the 2018 race in Vendée. After Victor Hugo Peña in 2003, Gaviria is the second from the country to put on the maillot jaune in the race’s 100-plus years. He topped Peter Sagan (Bora-Hansgrohe) in the stage one sprint after 201 kilometers. “We’ve been waiting for this Gaviria yellow jersey,” said Colombian Héctor Urrego, a journalist with RCN. Gaviria already topped all the world’s best sprinters in other races, but never had a chance to do so in the Tour de France. Last year in the Giro d’Italia, he won four stages and took home the points jersey. The goal is similar in his Tour debut. “He’s from the other side of the world, Colombia, and when he was watching them as a kid in the Tour de France, he was watching the climbers,” Quick-Step Floors boss Patrick Lefevere said. “He’s a totally different rider so he came his own way. He came here, not a nobody in Colombia, but people didn’t know him in Europe despite his two world titles in the Omnium. 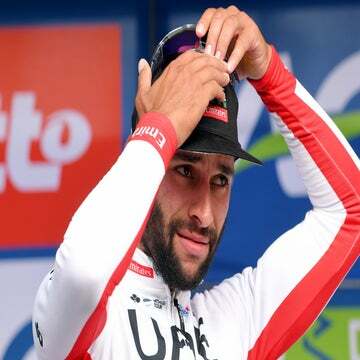 A breakaway of three Frenchman took the attention for most of the day, but the Belgian WorldTour team put its faith in Gaviria. 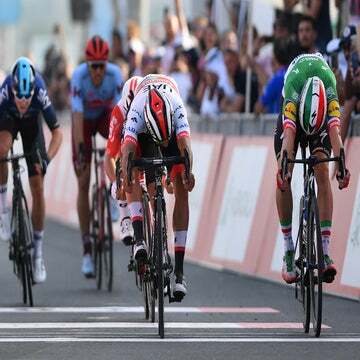 He beat Sagan, but also left behind stars including Mark Cavendish (Dimension Data), Marcel Kittel (Katusha-Alpecin), and André Greipel (Lotto-Soudal). “I know about Victor Peña, we talked, but not very often,” 23-year-old Gaviria said. “He’s a great person and directs one of Colombia’s important teams. And after 15 years, we finally have been able to give Colombia another jersey. Gaviria timed the sprint right but also the sporting moment. Colombia lost to England this last week and was unable to advance to the quarter-finals of the Soccer World Cup. Now, the attention turns to the Tour de France and the six escarabajos racing over the next three weeks. Besides Gaviria in the sprints, the country has Nairo Quintana (Movistar), Rigoberto Urán (EF Education First-Drapac) and Egan Bernal (Sky) to cheer for. “All the attention after the World Cup will continue, but on their shoulders,” Urrego added.